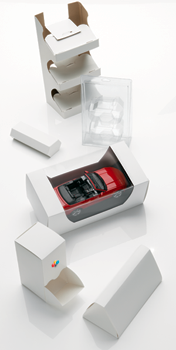 Integrated Marketing Packaging Solutions | Goldrich Printpak Inc. When it comes to helping our clients realize a successful product launch, we think outside the box. Clients often call on our years of experience in consumer and industrial merchandising during the earliest stages of marketing strategy development. We will not only recommend the most effective packaging solution, but can provide full creative execution, build prototypes for focus testing, and will even help clients define appropriate channels of distribution. Our ongoing work in the fast-paced and ever-changing retail environment gives us valuable insights into trends and opportunities our clients can turn to their advantage. Our retail merchandising solutions range from countertops, floor stands, POS and POP displays to sidekicks and pallet displays. We will take your display from design and assembly through to fulfillment. We can even round out your campaign with coupons and direct mail support. For clients who find themselves up against the pressures of limited space, capacity, equipment or manpower, Goldrich also offers a complete range of contract co-packing and fulfillment services, including club packs, bagging, blister and skin packaging and kit assemblies. We can package, assemble, label and warehouse your product, and ship directly to your customers worldwide with a range of import/export logistics and freight services.